This uniquely designed mug is pleasantly eye-catching on the kitchen counter or the dining table. Bringing you not only a tasty drink, but also a brightness to your kitchen! Don't overlook one of the most important parts about your morning coffee or afternoon tea - the mug you drink it from! 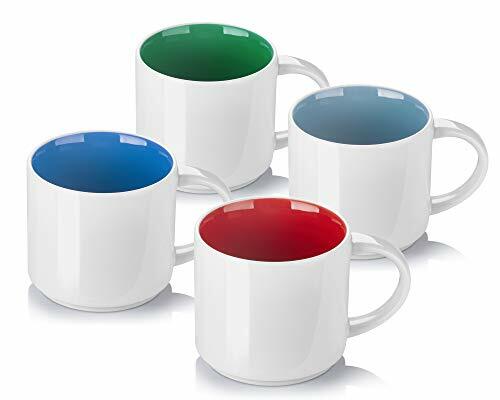 Many mugs are made from materials that alter the taste and quality of their contents, completely ruining your drinking experience. Our quality porcelain mugs are odorless and tasteless, ensuring that your favorite drink tastes just as fabulous as you intended. Whether hot or cold, a refreshing beverage is something everyone can agree makes our days a little better. Sure to spark a smile on your loved ones' faces, these mugs make the perfect gift for a house warming, wedding, birthday, or holiday event. Practical, efficient, and high-quality - what more could anyone ask for? √ 100% Satisfaction Guarantee If for any reason you are not completely satisfied with our products, you may contact us for an exchange or refund. LOVELY DESIGN: Enjoy 4 beautiful colors, including red, blue, green and grey, They can be stacked easily. View More In Mug Sets.